Veteran infielder Nick Punto has decided to officially retire, he announced last night on Dodgers Talk with David Vassegh (audio link). Punto signed a minor league deal with the D-backs last offseason but had a change of heart and backed out of the deal and sat out the 2015 season due to a desire to spend more time with his family. While Arizona manager Chip Hale stressed at the time that Punto was not retiring, it seems that the versatile utility man has now elected to formally conclude his playing career after spending parts of 14 seasons in the Majors. The 38-year-old Punto was originally a 21st-round pick of the Phillies back in 1998 and saw limited action in Philly from 2001-03 before being packaged alongside Carlos Silva and Bobby Korecky to acquire lefty Eric Milton from the Twins. Punto served as a utility option for the Twins in 2004-05 before spending much of the 2006 season as Minnesota’s everyday third baseman and batting .290/.352/.373 with brilliant defense in what was the best all-around season of his career. Punto helped propel the Twins to a postseason berth that year — one of four trips to the playoffs he had with that organization — but it wasn’t until his 2011 campaign with the Cardinals that Punto was able to reach a World Series and experience the feeling of capturing a World Series title. Punto’s overall offensive contributions in his Major League career were modest, at best, as he’ll retire with a .245/.323/.323 batting line in 3734 plate appearances between the Phillies, Twins, Cardinals, Red Sox, Dodgers and Athletics. However, Punto was a brilliant defender at three different positions: third base (+40 Defensive Runs Saved, +20.6 UZR/150 in his career), shortstop (+21 DRS, +17.4 UZR/150) and second base (+21 DRS, +5.7 UZR/150). Punto brought plenty of speed to the table, as evidenced by his 104 career steals, and he was known for his competitive nature and hard-nosed style of play, which earned him his nickname: “The Shredder.” That attitude and his brilliant defense helped Punto to earn more than $23MM in his playing career, per Baseball-Reference. We at MLBTR wish Punto and his family continued success and happiness in his post-playing endeavors. Veteran infielder Nick Punto, who had agreed to a minor league pact and a Spring Training invite with the Diamondbacks, will not report to D-Backs camp and is “shutting it down” for the 2015 season, manager Chip Hale told reporters, including FOX Sports Arizona’s Jody Jackson (Twitter links). Hale stressed that Punto isn’t retiring, but the 37-year-old has decided for the time being that he’d prefer to spend more time with his family. A gifted defender at second base, third base and shortstop, Punto has never been known for his bat, but he slumped to one of the worst seasons of his career in 2014, hitting .207/.296/.293 in 224 plate appearances for the A’s. He still played enough for a $2.75MM vesting option to trigger, but the Athletics elected to release him when in need of a roster spot in December. In a 14-year career between the Twins, Phillies, Dodgers, Cardinals, Red Sox and A’s, the affable Punto is a .245/.323/.323 hitter in 3,734 plate appearances. His best season came with the 2006 Twins, when he hit .290/.352/.373 with excellent defense at all three of the aforementioned infield positions (primarily at third base, however). Via Jackson’s colleague, Jack Magruder (on Twitter), Hale said the D-Backs have no intention to add another veteran infielder for depth purposes. 12:10pm: Nick Piecoro of the Arizona Republic reports that it’s a minor league contract with an invite to big league camp (Twitter link). 11:49am: The Diamondbacks have agreed to terms with veteran utilityman Nick Punto, reports Jon Heyman of CBS Sports (Twitter link). He is represented by agent Jeff Caulfield. Punto, who turned 37 in November, hit just .207/.296/.293 in 224 plate appearances for the Athletics last season after signing a one-year, $2.75MM contract. Nonetheless, Punto received enough playing time in Oakland and stayed healthy enough that he had a $2.75MM option vest for the 2015 season. However, Oakland ultimately elected to release Punto in December when they needed to clear a 40-man roster spot. He’ll still be paid the $2.75MM from the A’s, but it’s unclear at this time if his contract is a Major League or minor legaue deal. Though Punto has never hit much outside of a solid 2006 season with Minnesota and a small sample of 166 plate appearances with the 2011 Cardinals, he’s historically been a very capable defender at second base, third base and shortstop. His defense has slipped a bit as he’s aged, but the switch-hitter is likely still capable of backing up the D-Backs at three infield spots. Of course, the same could be said about the much younger Cliff Pennington. It’s possible that the D-Backs will look to flip Pennington and his $3.275MM salary to a team with an infield need, but Punto could also merely be a depth piece that will come to camp and compete for a job. The A’s will release Nick Punto to clear a roster spot, according to Susan Slusser of the San Francisco Chronicle (on Twitter). Oakland will be on the hook for his $2.75MM salary in 2015. 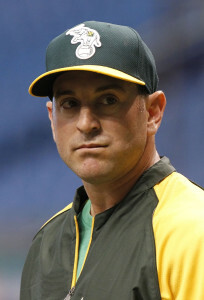 The A’s had 41 players on the 40-man roster, meaning that someone had to go and, ultimately, Punto was the odd man out. The infielder’s $2.75MM option vested late in the 2014 thanks to satisfying the terms of a complicated formula that was placed within his contract. The 37-year-old Jeff Caulfield client had one of his worst offensive seasons to date in 2014, batting .207/.296/.293 in 224 plate appearances. However, he did help the A’s by logging 363 quality innings at second base, and he also filled in at shortstop (118 2/3 innings) in addition to brief cameos in right field and at third base. Originally drafted by the Phillies, Punto was sent to the Twins along with Carlos Silva and Bobby Korecky in a trade for Eric Milton back in 2003. After a seven-year stretch with Minnesota, he’s bounced around to four other teams: the Cardinals, Red Sox, Dodgers and A’s. In 3734 career plate appearances between the six teams mentioned, Punto is a .245/.323/.323 hitter that has logged more than 2400 innings at shortstop, second base and third base with positive defensive marks at each. Athletics infielder Nick Punto’s $2.75MM option has vested, the infielder himself told Susan Slusser of the San Francisco Chronicle (Twitter link). As the switch-hitting utility man explained to Slusser, he had a fairly complicated formula that would determine whether or not the option would kick in, but he’ll indeed be back with the club next season. Punto, who turns 37 next month, signed a one-year, $3MM contract that guaranteed him $2.75MM in 2014 in addition to a $250K buyout of the aforementioned $2.75MM option. All told, the Jeff Caulfield client will end up earning $5.5MM over his two seasons with the A’s — a figure that is in line with contracts inked by other veteran utility types such as Willie Bloomquist (two years, $5.8MM) and Skip Schumaker (two years, $5MM). The defensively versatile Punto has never hit much, but he struggled through one of his worst offensive seasons to date in 2014, batting .207/.296/.293 in 224 plate appearances. However, he did help the A’s by logging 363 quality innings at second base, and he also filled in at shortstop (118 2/3 innings) in addition to brief cameos in right field and at third base. The A's announced that they have agreed to terms on a one-year deal with a vesting option on 2015 with infielder Nick Punto. Punto's deal is for $2.75MM in 2014 and he'll have the opportunity to earn the same amount the following year, according to Jeff Passan of Yahoo Sports (on Twitter). The option is based on days spent on the disabled list and comes with a $250K buyout if it's not exercised. Athletics assistant GM David Forst tells Susan Slusser of the San Francisco Chronicle (on Twitter) that the signing has nothing to do with Jed Lowrie and insisted that he is still the club's starting shortstop. Forst added (Twitter links) that if Punto's option does not vest, it turns into a club option. Forst also disclosed that the option vests if Punto spends less than 30 days on the disabled list, but there are other ways that he can get the option to trigger if he exceeds that number. The 36-year-old Punto offers experience at second base, shortstop, and third base. In 116 games last season, the veteran hit .255/.328/.327 in 116 games for the Dodgers last season. Across 13 big league seasons, Punto owns a .248..325/.325 batting line while offering quality defense in the infield. Punto is represented by Jeff Caulfield, according to the MLBTR Agency Database. The MLBTR staff extends our condolences to the friends and family of NBA Hall-of-Fame player and coach Bill Sharman, who passed away today at age 87. Sharman is best known for his legendary basketball career but he also played in the Dodgers' minor system from 1950-55, doing well enough to earn a late-season callup in 1951. Sharman was a so-called "phantom ballplayer" (a player who spends time on a Major League roster but didn't actually appear in a game) yet his status afforded him a unique spot in baseball history. The entire Dodgers bench was ejected for arguing a call on September 27, 1951, thus making Sharman the only player to ever be ejected from a Major League game without appearing in one. J.P. Howell and Nick Punto are the only two of the Dodgers' free agents who Mark Saxon of ESPN Los Angeles predicts will be back with the team next season. Saxon also predicts the Dodgers will decline Mark Ellis' $5.75MM club option and their side of Chris Capuano's $8MM mutual option. Letting that mostly veteran free agent group go is one of Saxon's five ways the Dodgers can reach their stated goal of getting younger in 2014. Other methods include trading Andre Ethier and acquiring David Price and Elvis Andrus. The Rockies will explore signing Jesse Crain if he's healthy and will look to re-sign Matt Belisle to a longer-term deal, Troy Renck of the Denver Post writes. Colorado has a $4.25MM option on Belisle for 2014 but Renck says the team will look to lower Belisle's base salary for next season in as part of a new contract. Renck also outlines several other Rockies offseason needs and notes that while they couldn't manage to sign Cuban first baseman Jose Dariel Abreu, the attempt at least showed that the club is trying and is willing to spend this winter. Also from Renck (via Twitter), he is "fascinated" by the Nationals' reported hiring of Matt Williams and notes that the Rockies came close to hiring Williams as manager last year before going with Walt Weiss. Even before their offseason moves have really begun, the Rockies and Giants are two of three teams projected by ESPN's Jared Cross (Insider subscription required) to have the best chance of improving by at least 20 wins in 2014. Cross also suggests a pair of free agents who could help the two clubs. A number of Padres topics are explored by Bill Center of the San Diego Union-Tribune during a live chat with readers, including whether the Angels' Mark Trumbo would be a realistic trade option for the Friars as they look to add power to their lineup. USA Today's Bob Nightengale tweets that Dave Duncan is a "perfect fit" as the Diamondbacks' pitching coach and that we should "keep an eye on" him as a candidate for the job. Duncan took a leave of absence from the Cardinals in 2012 and recently said that he isn't interested in serving as a pitching coach again. In other NL West news from earlier today, the Giants officially announced Tim Lincecum's new contract….Lincecum's feelings about re-signing are included as part of a collection of Giants notes….the Padres designated southpaws Colt Hynes and Tommy Layne for assignment….MLBTR's Steve Adams wrote a Free Agent Profile of Dodgers reliever Brian Wilson. The Dodgers have an abundance of backup infielders on their 40-man roster, and some of them may be moved, Ken Rosenthal of FOX Sports reports. Nick Punto could be a trade candidate, and Juan Uribe and his $7MM salary could be released, according to Rosenthal. Punto, 35, appeared in 87 total games for the Red Sox and Dodgers in 2012. He posted a .219/.321/.281 batting line in 191 plate appearances while earning a $1.5MM salary. He'll earn the same amount in 2013 before hitting free agency. Like Punto, Uribe has one year remaining on his contract. He'll earn a $7MM salary in 2013 after missing much of the 2012 season with a wrist injury. After acquiring Skip Schumaker from St. Louis, the Dodgers have seven backup infielders, including Punto, Uribe, Jerry Hairston, Elian Herrera, Dee Gordon and Justin Sellers. Gordon has drawn interest from many teams and could also be traded. The Dodgers designated Scott Van Slyke for assignment yesterday.